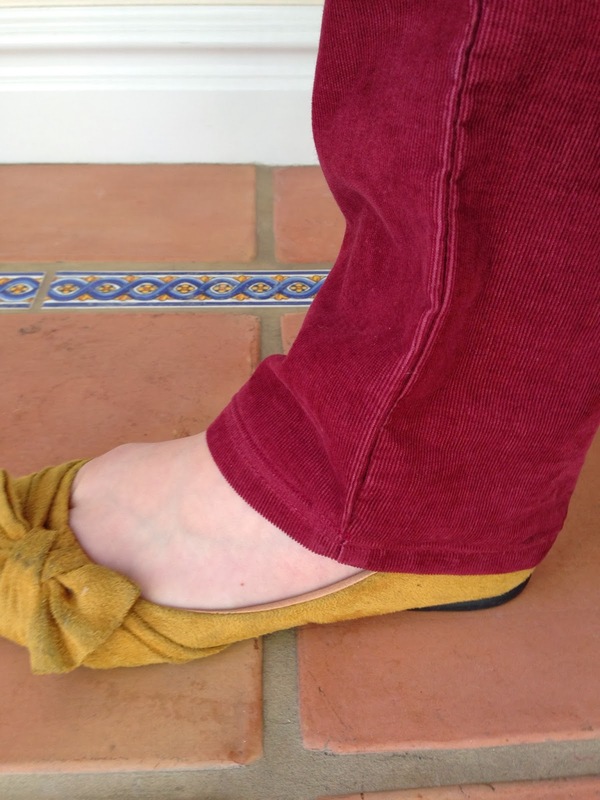 I'm thrilled to say that my blog post Hem Jeans Fast and Easy has become very popular. In fact I'd say that it has turned into sort of a forum about hemming jeans. I never thought in a million years that that post would be so helpful to people all over the world and I want to thank everyone for sharing tips and giving great advice on the subject. Thanks to everyone who left uplifting and positive comments! There were a lot of concerns and questions about fraying and a few great solutions to that problem. 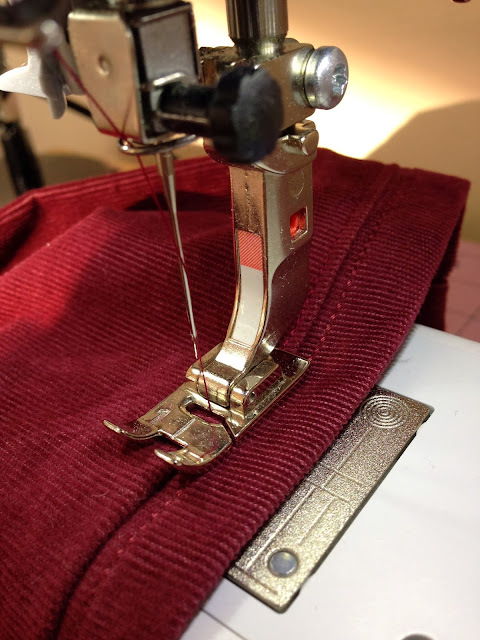 I thought I would try a few sewing methods mentioned in the comments since my mom needed some new pants hemmed. Here we go! *Update - We now have a video tutorial here! top stitch. This secures the zig zag stitch portion to the pant and prevents it from ever flipping up after you wash it. You won't have to iron after washing either. Just make sure the thread matches perfectly and keep your line straight and even. Here's what it looks like with the top stitch. When you put them on you can hardly tell there was any alteration. *If you don't like this look then just tack the sides up. This one was thrown out by a lot of people. This is the fastest and easiest way to prevent fraying. Just apply the fray check after you sew your first straight seam and cut off the extra fabric. Click the picture of the fray check to buy it at amazon. I don't have a serger, but this would be a great method to use. Instead of cutting off the extra fabric, serge it. This prevents fraying and it cuts at the same time. Fabulous! Thanks again to everyone for your words of wisdom! Love you all! Thanks for sharing such a great tip. I have sewn for over 45 years and am excited to apply this tip! (It would have saved my machine going through all those layers of denim!) Yeah! Will have to remember this once my sewing machine is back in commission. This is such a jeans-saver!!! I am short, as is one of my daughters, so I do a lot of hemming. She is pre-teen, and losing that neat bottom of the jeans has been a disappointment for her. Not any more! Thanks so much! 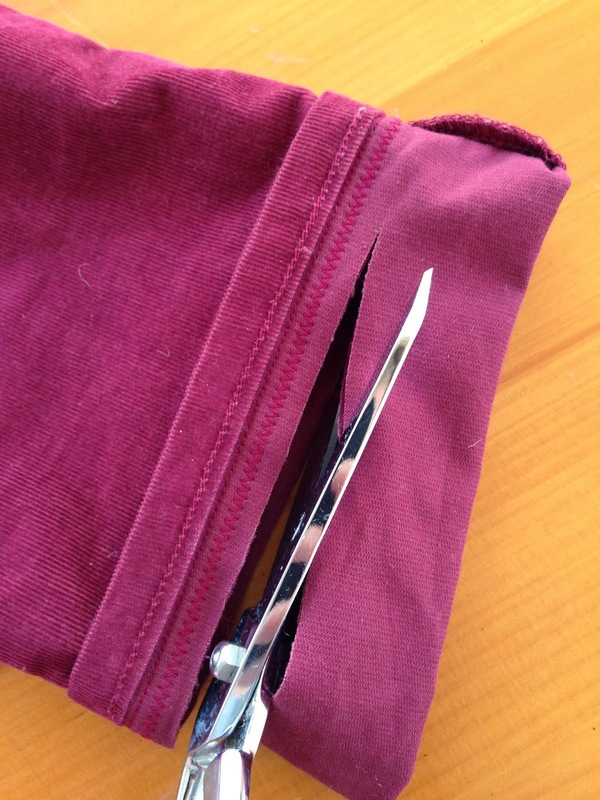 I learned this secret after years of stitching up hems the hard way. Love this! can you tell me where you got your slippers? I want a pair! Can you tell me where you got your slippers? I LOVe them! Thanks! White slippers were from Target a couple years ago. Yellow shoes, I can't remember but it's been a couple years. What does it mean to "tack up the sides?" I am a novice to sewing and am not familiar with that terminology. Will this work on bootcut or flared jeans? I nromally have to shorten up to 3 inches. I have a sewing shop sewn over 40 years. In business 15 years, and even when the fray check is used it does NOT stop the hem from curling up when wearing them. I sew the ORIGINAL hem back into the pants. Can't even tell I hemmed them. Depends on how much you have to cut off as to if the hem will match up with the leg up higher. I charge 12.00 a pair. I sew the white thread back into the hem. After you cut off the excess fabric, do a row of zig zag stitching next to the edge, allowing the zig zag to go off the edge on the right. You won't lose your stitches.....they encase the raw edge and prevent further fraying. I found this out accidentally. I did this on my grandsons pants... I left the extra fabric, tacked in up in a couple places. Then he grows I can take the old hem out and let it down, adding the length needed. 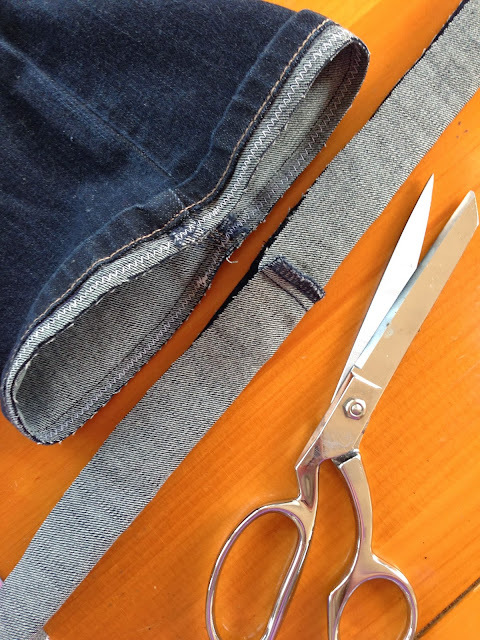 I needed this idea when I was cutting off and hemming overhauls.. Can use this next time for hemming. thanks for sharing.. love it. I'm excited to try this but... I need cut 31/2 inches off my pants and they are about an inch wider at the bottom then that far up. Is there any way to still make it work? You may want to try hemming the jeans like normal and then re-distressing the new hemline with sandpaper. I'm a tailor. It's a trick I often use when hemming jeans with the issue you are describing. 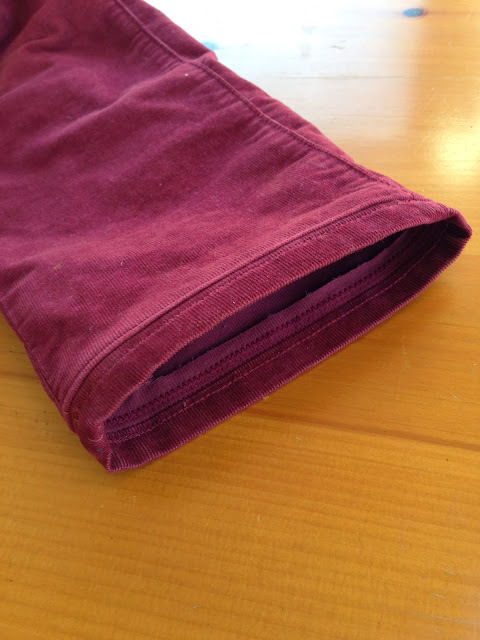 After you distress them with the sandpaper, you will probably need to re-stitch the hem if the sandpaper ate through your original stitching. After you wash them, the new hem should look like the original. Not just for the short folks! I am nearly 5'9". With some brands I find the regular length to be to be too short. I am forced to get the tall length which is too long and I must hem. I'm a rookie seamstress and have a short legged son. My problem is needles. I keep breaking them. What is the best size and/or brand? I break needles hemming my sons jeans. I love this idea but need help on what needle I should be using. Thanks! You can buy a plastic jig that you put under the back of your pressure foot to raise the pressure foot to the level of the layers of the jeans. It works great and no more broken needles! This jig works wonders, use it all the time. 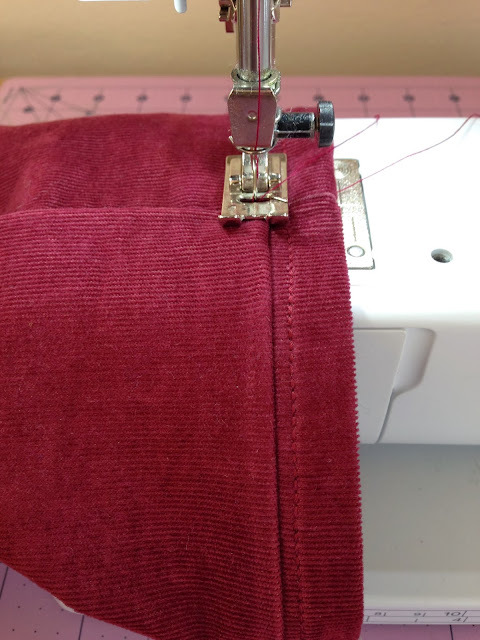 Another trick is to slow the machine down to a creep or turn the manually turn the needle. It takes a little bit more time but saves the time you would spend changing the needle when you break them. You can buy special needles for heavy fabrics called "jeans needles." Otherwise, a size 16 usually handles denim well. If you are finding that the hem doesn't fit back on the pants leg well, you can do a little fudging with the seams. Although the outseam is usually flat felled and hard to work with, the inseam is often just serged. You can open up that one or sew it in a little deeper. Make sure you taper the change well in to the seam. If you are doing a little girl's pants, you can often hide the difference with some rick rack or lace for a cute look! I do not have a sewing machine.. Can this be done hand sewn? I haven't tried this yet because the first pair I went to hem, the jeans tapered down so that the bottom is narrower than the rest. So how do you hem them when you turn them up but the original hem is smaller in circumference than where your sewing on to?